What Is Photoshop? How Photoshop Works? You have learned the use of MS-Paint in drawing and painting. MS-Paint is a useful software to create simple drawings. It has many features using which you could save your drawing, edit your drawing and get paint-outs of it. Despite having a lot of features, MS-Paint is not fit for handling complex figures and their modifications. 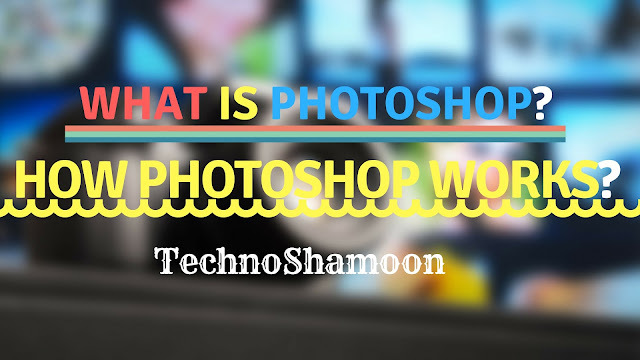 lest talk about what is photoshop In order to create graphics and work with images, the most common application software is Adobe Photoshop. This software is able to solve almost all the problems that we face with images. It has various different tools that help in drawing, shapes, coloring and editing images. Title bar: It displays the name of the application. Menu bar: It contains the main menu commands. Each commands buttons contains a drop-down menu. Options bar: It is situated below the menu bar. It displays different options available for the selected tool. Toolbox: It contains the tools available in Adobe Photoshop. Image Title bar: It displays information about the image opened in Photoshop. Image Window: It keeps the image to be edited. Status bar: It can be seen art the button of every document window and shows information such as current magnification, file, size, etc. Rulers: They are situated along the top and left the side of the image.These help in positioning the image precisely. Various tools are available in the Adobe Photoshop toolbox. Rectangular Marquee: It is used for making a selection on an image. Move Tool: It is used to select and move images. Magic Wand Tool: It is another tool for making a selection. Lasso Tool: It is used for making a free selection as you proceed. Slice Tool: It is used to create slices in an image. Crop Tool: It is used for cropping images. Retouching Tool: It is used for correcting images. Brush Tool: It is used for drawing freehand. Clone Stamp Tool: It is used for selecting a source and copying it to another place. History Brush Tool: It is used for restoring a specified history state. Eraser Tool: It is used for erasing the image or a part a specified. Gradient Tool: It is used for creating a gradient effect on images. Smudge Tool: It is used to make a smudge on the image. Sponge Tool: It is used to change the situations of color in a selected area. Path Selection Tool: It is used for selecting the active path. Horizontal Type Tool: It is used for inserting text in an image. Pen Tool: It is used for creating vector shapes. Rectangle Tool: It is used for drawing a rectangle or a square. Notes Tool: It is used for inserting notes in an image. Eyedropper Tool: It is used for selecting a color. Hand Tool: It is used for dragging an image when you are in the zoom in the state. Zoom Tool: It is used for zooming in and our. Step 1: Click on the tools described above are as follows. Step 2: If you see a small triangle at the tools right bottom corner, this means the tool has some more associated tools which are hidden. You can hold down the mouse to view the hidden tools. Then click on the tool you want to select from the submenu. Step 2: The Open dialog box appears. Step 3: Select the location of the file that you want to open using the Look in option. Then, select the file. Step 4: Click on the Open button. Step 2: The new dialog box appears. (b)Width and Height: In these boxes, width and height of the new file are given. We can choose the desired unit for width and height by clicking the down arrow keys and selecting an appropriate one. (c) Resolution: Number of pixels per inch is termed as resolution. The height of the resolution, the sharper is the image. But remember, the file becomes heavier if we increase the number of pixels. (d) Color Mode: Here we can specify the number of colors that can appear in an image, Selection can be made from the given options. These are Bitmap, Grayscale, RGB Color, CMYK Color and transparent. Step 4: Finally click OK. Step 5: A new blank file opens considering all the set configurations. Step 1: Select File → Save As. Step 2: The Save As dialog box opens. Step 3: Type the file name in the filename text box. Remember, the default extension of Photoshop file is.PSD. In Photoshop, foreground color is used to paint, fill and stroke selections. The background color is used to make gradient fills. it is used to fill in the erased areas of an image. The default foreground color is white. The foreground color can be changed using the Eyedropper tool Color Picker. Step 1: Click on the Foreground or background color selection box in the toolbox. Step 2: The Color Picker dialog box comes on the screen. Step 3: Drag the color slider. The selection tools in Adobe Photoshop, are categorized into two major groups. Marquee tools are used to select areas of an image in rectangular, square, elliptical or circular shapes. Step 1: Open the image. Step 2: Click on the small black arrow in the bottom right corner of the Marquee tool. The Lasso tools help us to make free-hand selections in an image. Let us learn to select an area of an image using the Lasso tools. The steps are as follows. Step 2: Click on the small black arrow in the bottom right corner of the Lasso tool icon. Step 3: Select the required move tool from the list of available tools. Step 4: Bring the mouse pointer on the image and drag it around the part of the image to be selected. To move an image or a part of an image from one location to another, we use Move tool. The step to use the move tool are as follows. Step 1: Click on the Move tool in the toolbox. Step 2: Bring the mouse pointer over the image or the selected part of the image. Step 3: Drag the mouse to move the selected part to another location. If there is no marking of selection, the entire image would move. The Crop tool in Adobe Photoshop is used to remove the unwanted area of an image. To crop an image, the steps are as follows. Step 2: Click on the Crop tool in the toolbox. Step 3: The shape of the mouse pointer changes to the Crop tool cursor. Step 4: Now bring the mouse pointer on the image. Click and drag to create a rectangular selection over the part of the image that you want to keep. Step 5: Release the mouse button. Step 6: The Crop marquee appears with handles on the corners and sides. Note that the part of the image to be retained gets highlighted and rest of the image gets dimmed. Step 7: Now to crop the portion of the image you have selected, double-click inside the crop marquee. I have told you some information about Adobe Photoshop now you decide it is good or bad I think its perfect for editing images because it is one of the best software in the world you can use it easily but its new version and some version are not free you need to pay for them but Adobe Photoshop 7.0 is free if you have windows 10 so in windows 10 Photoshop 7.0 comes free you can use that free lifetime but if you want new features and new look of the Adobe Photoshop so you can purchase Photoshop new version cc if you are a photo editor so this can be an amazing deal for you I highly recommend you I am not promoting it and this article is not sponsored I am promoting it because this is very useful for editor this is an amazing software Ok I know now you are boring so enough for today thank you If have any question comment on belwo.